28 years old, 2 burnouts . So I will tell you two stories . Two different experiences in two really different environments. Working as a campaign manager for a political electoral campaign 1 . A quick overview of a campaign manager job A final deadline you can’t change. A lot of responsibilities : I was babysitting in charge of 12 candidates. A lot of skills involved in a workday: strategy, communication, administrative and legal stuff, PR, human resources management, etc. Work hours: 9am – 10pm the good days, 7am – 2am the bad days. Working as a front end developer in a small French web agency 2. I hope this slide will stay empty. Two different experiences… but one unique pattern . How can we detect these situations ? Listen to yourself! Your body can give you a lot of clues. Three main things to watch: Resignation, exhaustion, inefficiency. Burnout is hell . ! But it’s not your fault . You must do something against it . It will not resolve itself . How can we recover from a burnout ? your condition : this is a real disease, ask for help. 1 . You need to take your time , and sometimes to make choices . 2. You need to adjust your environment . 3. There is no good stress . Stress is a natural body reaction, designed to be temporary . Stress over time turns into exhaustion. Three main things to watch: Resignation, exhaustion , inefficiency. Fighting stress is the best solution against exhaustion. I moved to a more peaceful city: Amsterdam. At work, we have fear… of everything. Judgement, failure, ratings, errors… Is our work this much scary? Nobody has ever been fired at Valve for making a mistake. It wouldn’t make sense for us to operate that way. Failure is part of the human process. We can learn more from our failures than our success. Three main things to watch: Resignation , exhaustion , inefficiency . Reducing fear is the best solution against resignation. I chose to focus my job on my main interests: accessibility and improving users’ web experience. Burnout involves one person. This person is not responsible. Burnout involves one person. But it’s a collective responsibility. We need to find a better work-life balance. Don’t hesitate to take sick leave when needed. Ask for more breaks. Ask for more research time. After a sprint, you need a break. For your brain, it’s the same! If needed, ask for a new team. A more inclusive workplace is needed for a good mental health. Fight for yourself, and for everyone else! Three main things to watch: Resignation, exhaustion , inefficiency . Asking for help is the best solution against inefficiency. Feeling over-whelmed, few days ago I asked for a new planning and different tasks: it worked well! How can we avoid these situations ? We have no super power. We are no ninjas , gurus , unicorns , rockstars or whatever. We are professionals. We deserve respect. Say it. Say it over and over. Never stop saying it. Listen to yourself. Learn from yourself. Watch for your limits. I just talked with William, I know you are no backend developer but we have this emergency. Can you fix it for tomorrow morning? Nope , nope & nope . If you work on unknown things, you need time. Ask for it. We must control our plannings. Tasks, deadlines, schedules: tell your limits and ask for help! Switching often between tasks is highly exhausting for our brain. And no, I mean, NO task ever takes only five minutes! We are not our work . We are more. 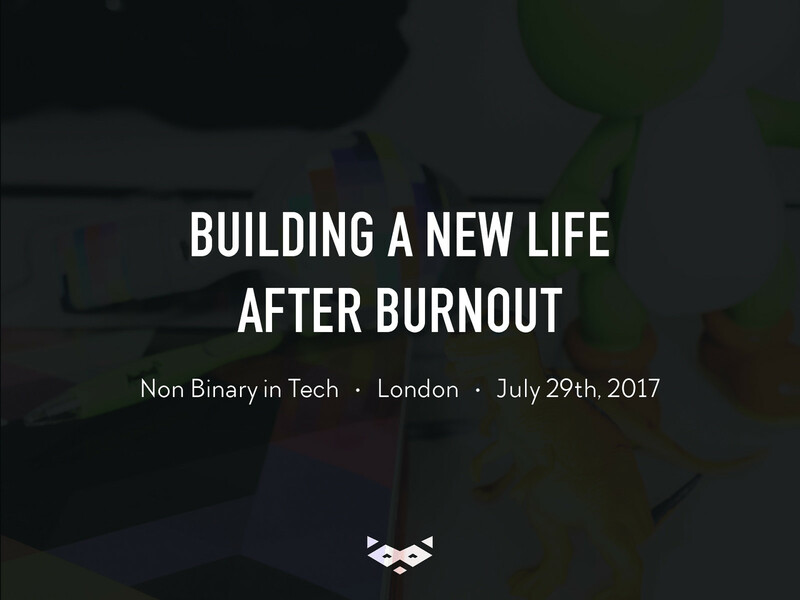 View Building a new life after burnout on Notist. 28 years old, 2 burnout. Today, all tech jobs offer a good working environment, a competitive salary and… beers! Great, isn’t it? But everyday I hear new stories of people recovering from burnout or severe depression. What is going wrong in our life? It’s time to find a better work-life balance.